rec. 20-22 April 2016, Hoddinott Hall, Cardiff. Bernard van Dieren has been neglected by record companies. Neither MDT nor Archiv list any CDs in their current lists. In 2001, the British Music Label (BML001) issued a ‘Collection’ of his music: this seems to have been long deleted, and has not yet appeared on ‘download.’ A second-hand copy is currently (23/09/16) on sale at Amazon for £260.87! There were two cassettes of piano music released in 1983 and 1986 by the British Music Society (BMS 402 and 405): perhaps this will be repackaged by Naxos? There are a few other bits and pieces on record and CD. Fortunately, there are many works uploaded to YouTube, typically derived from radio broadcasts, so all is not as bad as it seems. Bernard van Dieren was born in Rotterdam, Holland on 27 December 1887. Originally intended for a scientific career, he developed an interest in literature and learnt to play the violin. He studied music in Holland and Germany before moving to London in 1909 as music correspondent for various European newspapers, journals and magazines. There he began to develop his compositional skills. Van Dieren’s music was regarded as being ‘advanced’ at the time in both technique and style. He was lauded by Constant Lambert, Peter Warlock and Cecil Gray. Unfortunately, then as now, his music was more ‘often discussed than played.’ In the years prior to the Second World War there was a revival of interest in the composer, with a number of concerts and radio broadcasts devoted to his music. Unfortunately, his early death put paid to any continuing interest. In addition to the music on this CD, Van Dieren’s works include an opera, The Tailor, six string quartets, the Sonatina Tyroica for violin and piano, an Overture to an Ideal Comedy, songs and piano pieces. There is also an uncompleted Symphony in three movements. In 1935 he wrote a book entitled Down among the Dead Men: it was republished in 2013. Bernard van Dieren died in Golders Green, London on 24 April 1936. A great place to start exploring this CD is the Introit to ‘Les Propos des Beuveurs’ or ‘The Discourse of the Drinkers.’ This work was composed in 1921 and premiered on 6 September during that year's Promenade Concerts. It has been criticised as ‘ill-made music’ which was aimless and lacking development and direction. The piece was designed as an Introit or ‘Overture’ to a proposed choral work based on a text derived from Rabelais’'s Gargantua and Pantagruel. The music, which is scored for a large orchestra, begins with an almost Delius-like meditation, before an ‘allegro moderato’ interrupts the reverie leading to an impetuous waltz. There are some quieter moments before the work comes to an abrupt end. As Alastair Chisholm suggests in the liner-notes, the drinker may have collapsed. In spite of the bad press the work received at its premiere, I enjoyed it. There is an almost Malcolm Arnold-like roistering in the more energetic moments. I suggest that the listener next considers the ‘Elegie für orchester mit violoncello principale’ which will once again remind the listener of Fred Delius. I guess it is the chromatic harmonies, and rhapsodic meanderings that give this impression. I do not use ‘meandering’ here as a pejorative term: a better word may be ‘ruminative’ although neither do I not want to imply ‘pastoral.’ The piece is conceived very much in a single mood, with just the occasional irruption of something a little more acerbic. For me, it is a hauntingly beautiful work. It is played to perfection by Raphael Wallfisch. Alastair Chisholm has written a considerable essay on Bernard van Dieren’s Symphony No.1 ‘Chinese’, op.6 as part of the first-rate liner-notes. He gives a historical introduction to the work as well as descriptive notes about each of the eight movements. I wish to make a few general points rather than re-present Chisholm’s analysis. The Symphony was written between 1912 and 1914. It is scored for five soloists, chorus and orchestra. The texts that Van Dieren chose were German translations by Hans Bethge (1876-1946) of ancient Chinese poems which were published in 1907. Other verses from this volume were set by Arnold Schoenberg, Anton Webern, Egon Wellesz, Richard Strauss and Gustav Mahler. The musical ethos of Van Dieren’s symphony has been wittily summed up by a reviewer on Amazon as being ‘a mixture of chopsticks, atonality and perfumed exoticism.’ This is being a little cavalier with the facts, but it is an engaging summary. Strong chromatic writing does dominate this work, and it seems to tend towards atonality in places, but never in an overtly discordant manner. Listeners will also hear the influence (yet again) of Delius and Schoenberg of the pre-12-tone years. The Symphony is ‘nocturnal’ from end to end. The mood evoked is of the ‘beauty of the dark blue night with the lake glistening in the moonlight.’ Humankind enters the picture with thoughts of lovers separated and reunited. There is a more upbeat ‘drinking song’ but even here the mood is characteristically restrained. The scoring has a chamber music feel: the orchestra is not large. This adds to the nocturnal intimacy of much of the music’s progress. Like other works by Van Dieren, the Symphony has been criticised for being purposeless in its formal structure, as well has being overly eclectic in style between, and even within, sections. Much of the music’s progress is quiet. There are one or two climaxes, for example in the ‘Drinking Song’. There is an important orchestral interlude, which is a ‘nocturne.’ This section features particularly luminous scoring, that is also quite forward-looking in style. The premiere was given by the London Symphony Orchestra, the Wireless Chorus and soloists. It was conducted by Constant Lambert as a BBC wireless broadcast on 15 March 1935. YouTube supports a ‘commercially unavailable radio broadcast’ of the Chinese Symphony dating from 1973. The BBC Northern Singers and BBC Northern Symphony Orchestra conducted by Myer Fredman and the soloists were Vivien Townley, Enid Hartle, John Mitchinson, William Elvin and John Tomlinson. The uploader of the file apologises for the occasional noise on this performance. It was posted on November 2014 and has had some 815 views (23/9/16). The channel also hosts a considerable number of other works by Van Dieren: it is a treasure trove. Another version of the symphony is featured on the same channel. It was a radio broadcast of a performance by the Amsterdam University Choir and the Amsterdam Symphony Orchestra et al. conducted by Huub Kerstens in 1983. In 1976, Christopher Bunting and the RPO under Myer Fredman broadcast the ‘Elegie’ on Radio 3. It too has been uploaded to YouTube. In recent years, Lyrita have released a wide variety of CDs of music that has been garnered from the vast collection of recordings made from radio broadcasts by founder Richard Itter. Other items have been sourced from the BBC collection. Lyrita’s back catalogue has also been mined for material. The present CD is one of two recent productions that have been given brand new recordings. The other are the Francis Shaw’s Piano Concertos, which I have not yet heard. 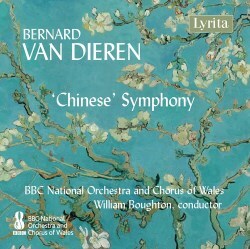 To make a new recording of the massive Van Dieren’s Symphony No.1 ‘Chinese’, op.6 and the other works in this CD involves a great deal of commitment from the performers and the production team at Lyrita. The result is a superb concatenation of sound quality and performance. Every detail of these complex and often intimate scores is pure, vibrant and well-balanced. The vocal and choral part are clear and finely sung. Lyrita are to be congratulated for investing in this exciting project which encompasses some relatively rare repertoire which ought to be an essential part of the wealth of British music. This latest release from Lyrita is outstanding. The repertoire is a splendid exploration of three of Van Dieren’s major compositions. As noted, listeners have had access to radio broadcasts of two of these pieces, however it is fantastic to have an excellent modern commercial recording in terms of production, sound quality, performance and documentation.